The first Kidney Kamper is a prototype that has been commissioned by the Wade Family. This will test not only the type of vehicle required but also the facilities it has to provide. The vehicle – a Mercedes Sprinter van – has been completely transformed by Nicola and Steve at Whatever Queensland and had its first proper run out when it was used as the media vehicle for the Ocean 2 Ocean Australia. 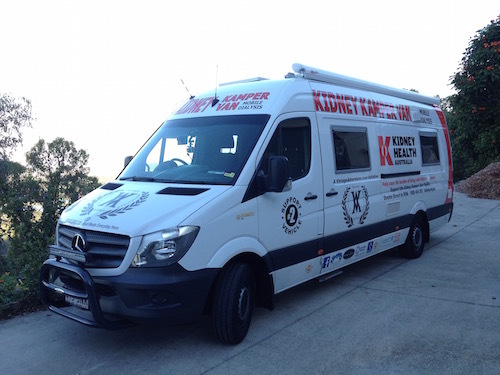 The Kidney Kampers are the reason we are undertaking these mammoth challenges – to raise money to create a fleet of ‘Kidney Kampers’ for Kidney Health Australia. These are campervans fitted with dialysis machines so those suffering from kidney disease can still have the freedom to travel away from the hospital for weekends away and short holidays. With kidney disease affecting Rod’s wife and daughter, the ‘prototype’ will be used by the Wade family until treatment is no longer needed. More than 11,500 Australians live on dialysis and it can be very difficult for them to take a holiday due to their treatment restrictions – which require them to dialyse three times a week for five hours per session. The creation of a fleet of ‘Kidney Kampers’ would mean that dialysis patients would have the freedom to take a self-guided holiday, without missing these life-saving treatments. Every day in Australia, 56 people die from kidney-related disease, whilst 1.7 million Australians are unaware that they have indicators of kidney disease – such as reduced kidney function. One of the final pieces of the jigsaw for the Kidney Kamper fit out was to have the special medical foam mattresses cut to size, covered and fitted. It took days to find someone that would alter the two mattresses that came with the electric beds. When Rod called to see Max at Century Foam & Rubber at Southport and explained what was needed he said he would come out and have a look at the van which was parked out front. He stopped when he saw the van all decaled up and asked what it was all about. Rod explained about the KK programme and the O2O Oz and within minutes he had his tape out, samples of fabric to remake the covers and offered to have them done in record time and at cost price. Thanks Max!